American Eagle Outfitters announced its Fall 2012 Back-to-School “Live Your Life” campaign, featuring 15 inspiring real people from across the U.S. and Canada. 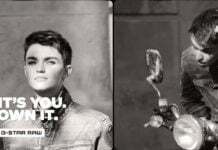 The “Live Your Life” campaign–which includes an actress, students, a fashion blogger, a pro basketball player, a magazine editor, musicians, a designer, an artist and more–is about positioning the customer at the epicenter of the brand, celebrating individual style through unique, real people and how they express themselves in their American Eagle jeans. The campaign marks the first time the brand has ever departed from showcasing traditional models in their ads, so it’s an exciting indication of their direction moving forward. Wowsie, I am really so over having super- übermodels representing brands! I believe that it is much easier to identify with a brand that shows us their clothes on people like you and me. Lookbook to follow – I can tell you, it’s amazing!